In the early hours of Tuesday 17 April 2018, the museum was broken into and a number of mainly jade and gold objects were stolen. Due to the specific nature of the pieces taken the police believe that the burglary was a targeted attack and the objects may have been stolen to order. While the monetary value of the objects varies, their historical and cultural significance is priceless. They also hold irreplaceable emotional value for our founder and everyone at the Museum is deeply sadden by the incident. In total, 48 object were stolen and three were damaged during the burglary. Below is a full list of the stolen objects. Please get in touch with us, or Avon and Somerset Police, if you have any information which might help us to recover these items. We are embarking on a really exciting journey on re-imagine our Museum following the burglary. Please learn more about the The Reimagining Project and help us along the journey. 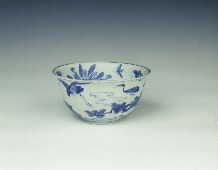 376 Blue and white porcelain bowl with two cranes and pine. Late Ming dynasty (late 16th century) D: 14cm A thinly potted blue and white bowl delicately painted in various shades of blue with two cranes one in flight and one in a pine tree in a continuous landscape on the exterior, the interior with a broad band of butterflies and flowers under the rim and a central medallion with kingfisher on lotus, the blue predominately of pale silvery tone. Southern Song dynasty (12th-13th century) D: 15.3 cm A qingbai flat bottomed dish decorated in the centre with two cranes carrying millet fronds. The rim is unglazed and the colour is of pale bluish white. Jin dynasty (1115-1234) D: 10.8cm A Ding-type bowl, the white glaze covering finely moulded decoration in the interior of deer in varying postures in landscapes within six compartments separated by raised lines. In the centre is a swirling flower head surrounded by an unglazed band, characteristic of this kiln, and a glazed band of stylised waves. The footrim is unglazed and the exterior undecorated. H: 7cm A square double-handled cup with indented corners and ogee-form. The handles are of squared curling form decorated with duo key-fret on both sides on top of bamboo sprays in underglaze blue with green enamelled leaves. On the other two sides, one is decorated with two deer, the other with two storks under a pine tree with a part sun above. Each side is framed by double underglazed blue line borders. H: 5cm A water container in the shape of a half peach with some small leaves, covered with a very thick greish green glaze, the base showing six tiny spur marks. H: 6.5cm A bowl decorated with figures, pine tree, deer and horses in underglaze blue of various tones on a cafe-au-lait ground. Late Qing dynasty (19th century) L: 23.3 cm A Yixing pottery crab, naturalistically modelled and unglazed except for patches on the underside. Qing dynasty, Kangxi period (1662-1722) H: 13.6cm A biscuit group of the he he er xian (the twin spirits of mirth and harmony), one in yellow robes and one in green. Both figures are standing arm in arm by a shell on a pierced aubergine rock formation. One is one holding string of cash round his neck, the other holds a ruyi sceptre. H: 16.5cm A Jizhou stoneware vase of almost meiping shape with a flat everted lip. Decorated directly onto the body with freely drawn lotus, hibiscus and peony, separated by butterflies in brownish black glaze all covered by a transparent glaze. The base is unglazed revealing the buff body. H: 7cm A covered box of flattened peach form covered with a cafe-au-lait glaze of rather glassy golden tone, the top surmounted by an unglazed pigeon holding a spray of leaves in its beak. H: 4.3cm Bamboo carving of a female crab, its claws and legs held close to the body, the eyes protruding and lacquered black, the carapace is removable to form a shallow box. Qing dynasty, Kangxi period (1662-1722) H: 17.9 cm A reticulated bamboo potpourri holder, deeply carved with lotus flowers and leaves, one with a small crab. Late Ming dynasty (1600-1644) H: 3.3 cm A small carved bamboo seal with mythical standing beast (probably a qilin) on stepped plinth. There is a carved seal on the base. H: 10.7cm A bamboo root carving of a ribbon-tailed bird standing beside a perforated rock, holding in its mouth a peach spray. H: 9cm A rectangular purple sandalwood covered box. The cover is decorated a pair of mandarin ducks beside rocks framed by overhanging sprays of flowering tree, chrysanthemums, peonies, berries, a prunus tree and two birds. The motives are made with pieces of inlaid green stained ivory, coral, lapis, soapstone and mother-of-pearl. The interior of the box is fitted with a plain detachable tray. H: 3.1cm A small birdcage fitting of deeply stained ivory depicting Dong Fangshuo holding a fan with a servant holding a peach before a pine tree. The fitting is waisted to fit between the cage bars and the reverse has a squared hollow holder to take a feeding vessel. Tang dynasty (618-907) D: 15cm An eight-lobed tinned bronze marriage mirror decorated in relief with a small circular medallion. The decoration at the top depicts a hare pounding the elixir of immortality to the west of a bodhi tree with a toad to the east of the tree. At the bottom (or south segment) is a three-clawed dragon over waves, with two trefoil clouds flanking the dragon. On the west and east of the mirror are two long-tailed birds in flight carrying knotted ribbons in their beaks. H: 4.7cm A circular cloisonne enamel box decorated with a single peony spray and butterfly in famille rose enamels against a turquoise blue background. The whole piece is underlaid by a silver foil ground with silver wire for the cloisons and silver base material. H: 4.3cm A bronze qilin with extensive tresses of hair on both sides of the slim neck. Its incised tail is curled, the animal is lying slightly curled, and notably its front paws are crossed over each other. H: 3.7cm A bronze qilin lying down straight out. The animal’s head is up and turned to one side with long incised tresses coming from the head and curling down the neck and incised bushy curled tail. The head has a two pronged horn sprouting from the top of its head. W: 7.3cm A black wood figure of a qilin on a bed of waves, its head turned back looking towards its tail. There is a mark on the base with six characters that reads ‘Hongwu Yuan nian wu zhong’ (1369). H: 4.3cm The animal is squatting with its head turned towards the rear with its trunk raised. Its hocks have flames and striations and long hairs at the back of the head. W: 6cm High relief incised decoration includes butterfly, insect and vines. Silver shaft and spoon with purple stone on silver clawed mount. H: 7cm Glass imitating turquoise. Painted enamel decoration on one side of foliage growing from a rock and an insect. Inscription on reverse, 17 characters in standard script (including makers (?) seal in archaic script), very feint and hard to read. Ivory/bone stopper, dark blue stone in brass/gilt bronze mount. W: 5cm Main body is of a milky white/clear glass, overlaid decoration in dark ruby colouring depicting a bird holding a branch in its beak. Stylised decoration, some archaic patterning. Exact image repeated on reverse. Ruby ring foot. Orange stone in gilt mount. W: 6.3cm A pale celadon-green pebble carved in the shape of two mandarin ducks positioned head to tail each holding a lotus spray. In places the orange outer skin of the pebble is showing. The entire group is shown sitting on a lotus leaf. The bird’s crests and tails have fine incision. The bodies and heads are somewhat compromised from nature to accomodate the designs within the confines of the pebble. Late Ming dynasty (1550-1644) L: 11.2 cm A carved black and white jade pebble in the form of a pair of mandarin ducks holding lotus flowers in their mouths on a bed of waves. The waves are rendered in late Ming style with whirlpools. H: 4cm A whitish jade pebble carving of a stork and deer lying side by side holding between them an acanthus spray. The details are well carved. The stone is of greyish-white colour with brown veins. W: 1.5cm A standing qilin with its long neck drawn back. The head has been very finely done to show the muscles, the neck has tresses, the body is covered with scales. The tail is between the legs and curls up to touch the back of the neck. The legs are like eagles’ legs and claws. There are flame-like projections at the front of the forelegs and rear legs. The jade stone is of greyish celadon colour with considerable brown patches. W: 2cm A well carved jade two horned qilin. The jade is of lychee flesh colour with some brown flecking. The qiling is seated on its haunches, its nose in the air, its tail with fine incised lines curled up by the left rear leg. A long beard is finely incised all along the jaw ending in two long curling side burns. The neck has finely incised hair; the base is plain. The eyes are incised with two rings. The body is pierced for suspension. H: 4.5cm A yellowish-white jade qilin, its horned head facing the rear, with mane of brown colour. One of the animal’s front legs is bent as if just about to get up. The base is flat and almost uncarved. W: 4.8cm A jade pebble group of buffalo with small qilin climbing up onto the back of the buffalo. The head of the qilin is turned towards the head of the buffalo which holds in its mouth the tail of the qilin. W: 2.7cm A jade of a one-horned winged qilin delicately carved with wings sprouting from its front legs. The tail has a bi-forked end that comes between the legs and goes up to the back. The animal is standing on a thin layer of stylised swirling clouds. The jade is of yellowish brown flecked colour. W: 7.5cm A pink soapstone seated smiling figure of Dongfang Shuo with one hand holding a peach and wearing a cloth covering on his topknot. The face, beard and borders of the robes are intricately incised. The signature of Yang Yuxuan is subtly incised on the rock seat. H: 10.3cm A jade figure of Dong Fangshuo (a Daoist immortal) as an old man with wind swept cloak and cloth cap. He is holding over his shoulder a gourd tied with a cloth to a peach spray. Late Ming dynasty (1550-1644) H: 9.3cm A grey jade figure of an immortal by a fruiting peach tree. The jade has extensive black and brown flecking. W: 3cm A pale celadon jade group of two phoenixes arranged tail to tail. Both birds have heads turned inwards, the bigger with a large sprig of lingzhi fungus, the smaller without. The wings of both birds are decorated with a stylised design, the whole piece has been conceived as a brushrest. H: 4.5cm A jade group of bird with peach spray, one peach protruding. The bird’s head has been sensitively rendered, the whole with traces of the russet marking of the original pebble. Song dynasty to Ming dynasty (12th-15th century) L: 5.3 cm A small carved green and brown jade goose with neck curled back towards tail holding fruiting peach branch in beak. W: 2.6cm A jade monkey in crouching position holding a peach up to its jaw. W: 7.5cm A celadon green and brown jade rebus pebble of two peaches with leaves and bat symbolizing immortality and happiness respectively. The outer and inner surfaces of the leaves are worked naturalistically with the veins incised and in relief carving. Late Song to mid Ming (13th-16th century) L: 8.5cm A white jade belt hook with pale brown suffusions. The hook is well-carved with a dragon’s head. On the handle is a kui dragon with well contorted body, some fine line details and tail screwed up to a point. Southern Song to Yuan dynasty (1127-1368) L: 9.2cm A white jade garment hook, the hook of which is formed by a ram’s head in high relief with twisted horns, detailed eyes, mouth and jowls. The body of the hook is covered with raised rice pattern spirals. 18th century L: 6.2cm A small white jade garment hook with back circular knob for attachment. The top takes the form of a squashed undulating bird carapace, probably a goose, with detailed feathers and wings and turned up tail. The head is turned back towards its tail to form the slightly off-centre hook, the head with neck fringe. Total Set of three gilt bronze mounted white jade appliques for a textile belt. It consists of 1) one narrow plain jade tongue with wavy edge at both ends, the back mounted with plain gilt bronze with fragment of textile between bronze and jade, the jade mounted with gilt bronze striding lion with fungus; 2) two of flower shape with indental borders, pierced with oval hole for suspension, three gilt bronze nails for affixing. Tang dynasty (618-907) D: 4.6cm A white jade circular openwork dragon plaque. The dragon has three claws and a long snout and one leg crossing over the tail typical of the Tang dynasty. The legs and claws form most of the outer edge of the plaque.